Elevated obstacle course allows visitors to navigate interior while suspended from eucalyptus trees. CATALINA ISLAND — Imagine experiencing the Catalina interior from high atop a eucalyptus tree. For the next few weeks you actually don’t have to imagine, as outdoor enthusiasts and adventurous explorers can experience the island from new heights. Catalina Aerial Adventure gives the island’s visitors a chance to scale, slide and even swing from tree to tree. 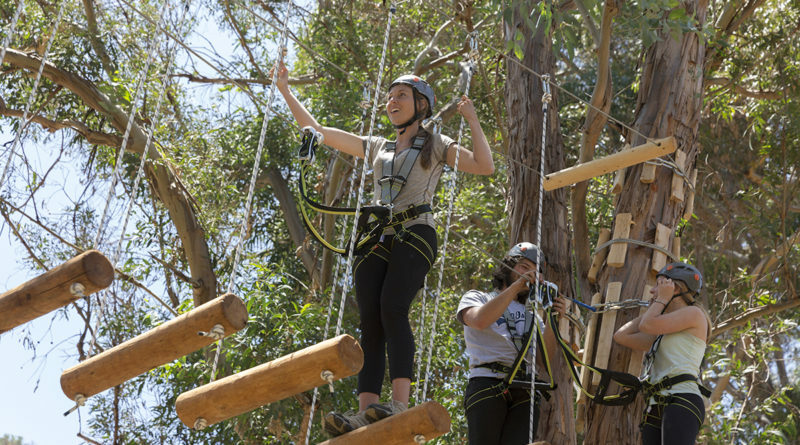 Five self-guided tours placed at varying levels among local eucalyptus trees feature rope ladders, log bridges, balance beams and zip lines, giving users a chance to enjoy Catalina’s outdoors from another level. Each obstacle is located in the trees and above the canyon floor. The Aerial Adventure course is located near Descanso Beach. Tickets must be purchased in advance and cost between $39 and $49. Other outdoor activities at Descanso Beach include the Catalina Climbing Wall, Descanso Beach Club and Zip Line Eco Tour. Visit visitcatalinaisland.com/adventure for more information. Editor’s Note: The article originally noted the Aerial Adventure would be active through Aug. 31. However Aerial Adventure is a permanent feature at Descanso Beach.